Making overnight oatmeal with chia seeds is a wonderful way to support your healthy breakfast goals. I think it is far easier to eat well when you make a plan. These overnight oats don’t require cooking (just a bit of planning) and are packed with goodness. Many of my healthy breakfast snacks including my baked eggs in a muffin tin can be made the day before you want to eat it. You can make these on Sunday and be ready for the school week ahead. Over the years, I have been slowly adding chia seeds to my food. I read an excellent book, Born to Run by Christopher McDougall, about a tribe of runners that uses chia seeds to fuel 100 mile runs over mountains (not kidding). Adding a seed to your food (pumpkin, sesame, pomegranate, flax, sunflower) increases the amount of nutrients you consume and adds crunch or flavor. Think of them as an unprocessed multi-vitamin. The ingredients photo above left out the MILK that you need to make the recipe. I would have taken the photo again but I was out of yogurt after I mixed everything up. The life of a food blogger is filled with moments when you realize that SOMEONE has eaten the food you need to create a recipe for the website. I am usually running out of time when this happens and I don’t live very close to the supermarket. AGH! It would be ideal to have an entire kitchen dedicated to my job and another for feeding my family but that is never going to happen unless I take a job at the Food Network. Of course, first they have to offer me a job which is also – never going to happen. My family gave this mixed reviews. My husband loved it. My daughter thought that the gelatinous texture (caused by the chia seeds) was gross. I thought it was good with LOTS of strawberries and blueberries. 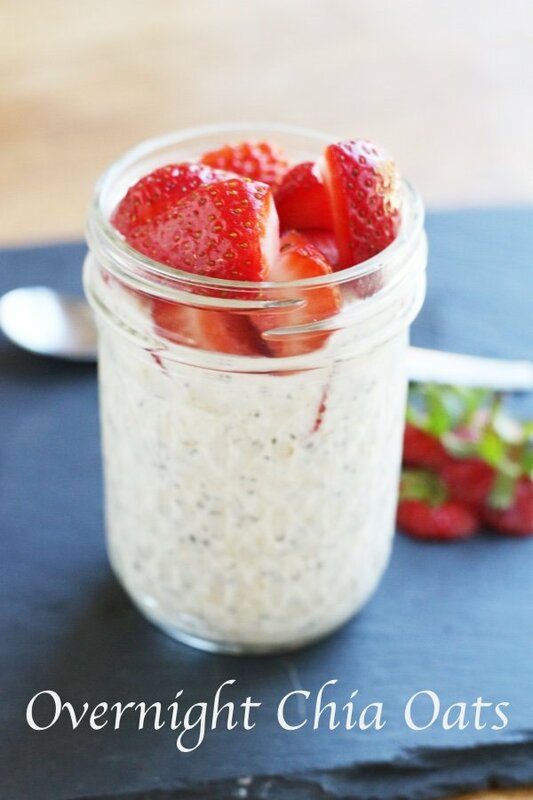 Have you made overnight oats? What do you put in it? 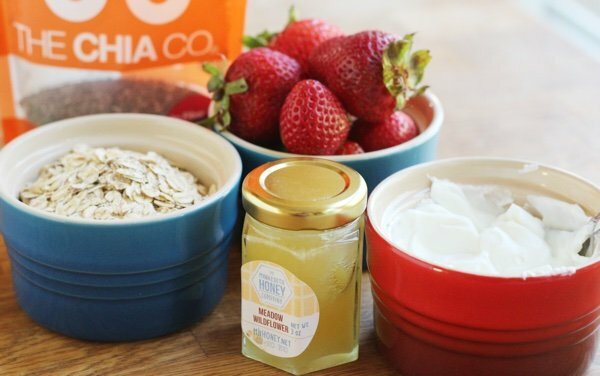 Mix rolled oats, almond milk, Greek yogurt, chia seeds, and honey in a small bowl. Store in an airtight container for at least 6 hours and up to 3 days. Slice strawberries and add when ready to eat. Have you ever tried to baked eggs in a muffin tin? The result will stop you from buying a fast food breakfast. I eat overnight oats for breakfast almost every morning. If you don't like the gelatinous texture from the chia you can reduce the amount or just leave them out. I use a chia/flax mix but you don't really need either, these are also great with nut butters or peanut butter powder. In the fall I make them with apples or pumpkin. I make overnight oatmeal on a daily basis, and I love it! You do not have to use chia seed or yogurt. I make a carrot cake overnight oatmeal that includes: 1/2 cup old fashioned oats, 1 cup of Almond milk, 1 teaspoon of cinnamon, 1 teaspoon of coconut sugar, 4 tablespoons of unsweetened coconut, (or raisins), and 8 baby carrots. Process the carrots and Almond milk in the food processor, and add to other ingredients placed in a wide mouth jar with a lid. Place in fridge overnight. Add cut up pecans or walnuts when ready to eat, next day. Do you eat this cold or warm it up in the AM? If you want oat milk here is the recipe. Better than almond milk IMHO. Cook up the oatmeal according to directions. Put it in a large bowl and let cool to lukewarm If too hot the miso enymes will be killed. Add one large tablespoons of hatcho miso or any fermented miso and stir well. Strain and put the milk in a jar in the fridge. You can have it cool or warm. Don't heat too hot or the healthful enzymes will be killed. This is process makes the oatmeal even more rich in vitamins and minerals. The enzymes break down the oats so that the liquid remaining is delish. The remaining solids can be put in soups or cereals. Can you use steel oats? I make overnight oats all the time. I usually do a snack version for less points. It's 1/4 cup oats and vanilla almond milk, 2-3 tsps of unsweetened cocoa powder, 1 tsps of honey. Sometimes I add a little pb2. Soo good! Works out to 3 sp. 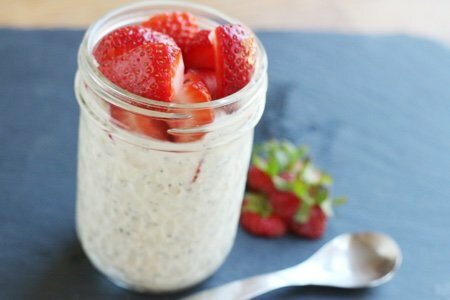 I make overnight oats pretty much daily, and have varied the recipe over time, just depending on what I have on hand or what I am feeling like adding. The standard ingredients include oats, chia seeds or hemp hearts, and non-dairy milk or yogurt. For the variations, ometimes I'll mash in half a banana and add a tbsp of maple syrup, some almond milk and pb2, or if I want more of a dessert-y version, I'll add in a tbsp of cocoa powder, and top it with a tbsp or two of coconut cream and some cacao nibs. Almost too good and decadent to have for breakfast! I, too, make overnight oats almost every day and have been doing so for about five years. I stir the dry ingredients in a huge coffee mug, add the liquid (water or non-dairy milk, depending on the day), stir well (the chia seeds are mucilaginous, so they'll take a minute or two to gel up and must be stirred again after that happens) and stick the mix in the fridge overnight. The next morning, I stir it all again, add a sliced banana and a diced apple (I [heart] Fujis, but I'm sure most anything will do) and heat it up. If I'm running late, I throw it all into a to-go cup and eat on the road. If I'm traveling, I can usually make one the night before and put it in the hotel mini-fridge or even the ice bucket. If there's no microwave, it's just fine cold, too. I make your recipe all the time. Tonight I added some of milk from my Golden Milk recipe with ginger, tumeric, cinnamon, and cardamon. Gives it a really nice warmth. I eat oatmeal with chia and flaxseeds for breakfast everyday. Chia is great four your health in so many ways, fiber, omega 3, weight loss, etc but the oatmeal is terrific on its own. I wish that people would learn that oatmeal actually can extend your life by helping you lower cholesterol (there's a ton of studies on this:http://www.collectivewizdom.com/FoodsThatLowerCholesterol.html?fullweb=1) and by filling you up, making you eat less throughout the day. I remember when I was growing up that my grandmother started her day with oatmeal and she lived to 96, despite eating a not so healthy diet otherwise.